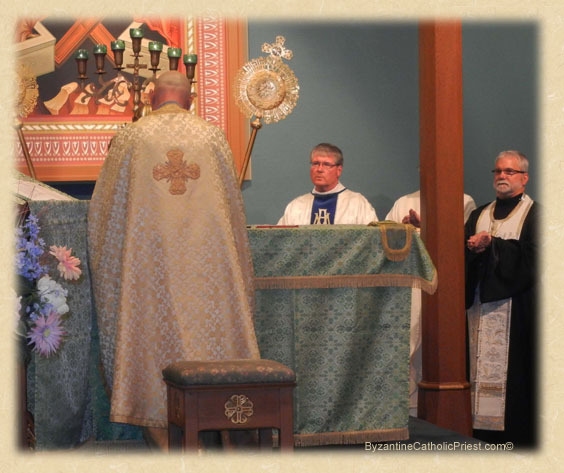 Dinner Speach following the Divine Liturgy in Thanksgiving of My Twenty-Fifth Anniversary of Ordination. St. Michael the Archangel Church, Allentown, Pennsylvia. 12:00 PM 5/31/2012 — I would like to begin by expressing my gratitude to everyone who is here, and particularly to Larry and Metro and Loretta and whoever helped them in preparing for today's celebration. Since I was not involved in the planning of this at all, I don't really know who did what; but they all have my gratitude. I want to begin by introducing you to some of the very special people who have traveled from far and wide to celebrate with us today, first among them being my mother, Mrs. Nancy Orth Venditti, a resident of Ryder-wood Assisted Living in Silver Spring, Maryland, or, as we like to call it, “The Home.” She is able to be with us today because of my younger sister, Mrs. Mary Ruth Yao, her husband, Joe, and their three extremely accomplished children, Theresa, Christina and Michael. They live in Kensington, Maryland, and were kind enough to drive our mother here. Christina just graduated from high school, and Theresa graduated from college and will begin this Fall teaching 6th, 7th and 8th grade math. My older sister, Nancy, and her husband, Dr. Peter Gauss, did not initially plan to be with us today, as they both have heavy responsibilities at the Western State College of Colorado, where they are both on the faculty, I guess teaching cattle driving and bronco breaking, or whatever they teach there; but my mother, despite being locked away in The Home, successfully fulfilled her function of guilting them into coming. And we conclude the family reunion with my favorite aunt and uncle, my mother's brother, Dr. Jack Orth, and my aunt Mary, who represent, I believe, the last remnant of the family from the city of its genesis, Baltimore. They were both present at my ordination in Metuchen twenty-five years ago, and my first Mass in Bethesda where we were living at the time. And I am very grateful for their presence here today. As you can see, we have a number of priests with us today, most of whom have been ordained a lot longer than I have, which begs the question why we're having this shin-dig; and I'll address that subject in a moment. But I do wish to introduce them to you, beginning with our Eparchial Administrator, Father Edward Cimbala, who was ordained a priest on May 8th, 1988, just one year after me. Nowadays, of course, he spends most of his time praying that he not be selected to be our next bishop. Father Robert Hospodar is a priest that a few of our parishioners know, or at least have heard of, especially if I have prodded them, for whatever reason, to wade through the muck and mud of canonical procedures. Not only is he pastor of the capitol of the world, New York City, but he is also our Eparchial Chancellor. He's the one we have to call when we think we've messed things up. But somehow, he finds a way to untangle the mess. He became a priest on May 14th, 1978. Father Edward Higgins, of course, you all know, because he was once pastor here. He is now pastor of twenty or thirty parishes in and around the city of Philadelphia. As you all know, he is always quick to help out in spite of the fact that he has very little time to do so, and was particularly helpful during the time I spent in hospital and recuperating afterward. He was ordained on May 14th, 1976. Father Peter Hosak requires no introduction to our two parishes. He was ordained on July 31st, 1983. I don't think Father Peter will appreciate how much it means to me that he is here today. He preceded me as pastor here, and was here for almost fifteen years. And as the years have gone by, I have come to realize that, when you are in a tight spot—and God knows I've been in a few—there are few people whom you would want watching your back more than Father Peter; and I only hope that I will have the chance to return that favor some day. There are other priests here, too, and I mention them in no particular order, because that would've required effort. You'll also notice that I'm not mentioning where these priests are currently stationed because I don't really know for sure, given my habit of deleting any e-mails from the chancery. Father Peter Donish was ordained on December 27th, 1970. Msgr. John Sekellick was ordained on July 13th, 1969. Father Gary Mensinger was ordained on June 7th, 1998. Father Gary and I also served together as parochial vicars under the late Father Bob Radvanski; and any of the colorful stories he may tell you about those days are all lies. Also be aware that his particular hobby is demolition derby, and I caution you to make sure you get your car out of the parking lot before he gets to his. Father Gregory Hosler is the pastor of where I was pastor before I came here, Nativity of Our Lord in East Brunswick, so I know where he is. He was ordained on September, 30th, 2001. Father James Badeuux, otherwise known as the Ragin' Cajun, is our only Louisiana transplant. I lived there for a time, so I can tell you with authority that it's definitely pronounced Loo-siana, not Loo-ee-siana. Father Jim was ordained on June 6th, 1999. Father Robert Lozinski was ordained on April 28th, 1973. Father Joseph Bertha was made a priest on May 11th, 1980. Father Micheal Salnicky has always been a good friend. Not only does he serve as pastor our what he calls “Our Little Church in the Poconos,” meaning St. Nicholas in Pocono Summit, but he also cares for our beautiful St. Nicholas Shrine and Carpathian Village in Cresco, with many cabins still available for those wishing to spend some time in the cool mountains this summer; please see Father Michael for details. Father Gregory Noga is a local boy. His parents still live here. He became a priest on October, 14th, 1976. Father Mykhaylo Prodanets was ordained on July 24th, 2001, and his parish is celebrating its 125th anniversary later this year. If there are any other priests of our Eparchy that I have purposely forgotten and now wish to pretend I didn't, this is, of course, your punishment for not getting your reply cards back in time. I saved the best for last: four of my classmates from the Dunwoodie Class of 1986 are here with us today. They are all priests of the Archdiocese of New York, and we have remained close ever since. The class is much larger that this; there are ten of us, as I recall; but these are the ones who like me. The first one you already know: Father Michael Morrow, who preached our homily today. Any longer and this would've been breakfast. He's here today with his mother, Audrey, whom I wanted here because they were both kind enough to be present both at my ordination and my first Mass twenty-five years ago. Stationed with him in the picturesque hamlet of Yonkers where he serves as the Vicar and Dean, is another classmate, Father Leonard Villa. He's a unique man, having been a civil attorney and a naval officer. We lived next to each other in the seminary, and he's been my best friend ever since, and he has visited me here frequently. Father Joseph Tierney led our class during our seminary years, and liked school so much that he decided never to leave. He's now the president of Cardinal Hayes High School. You may want to consult with him while he's here, since he's somewhat of an expert on how to correctly calculate the appropriate tip when visiting a restaurant. Last but not least, Father George LaGrutta is here, for which I'm particularly grateful, since he had to travel quite a distance to be with us today. His road to the priesthood was a long and crooked one, and it resulted in one of the most dedicated and holy priests you will ever meet. And while they are neither priests nor blood relatives, I should like you to know some very good friends of mine, and that's the crew from Ron's Tobacco Village in Whitehall. And we're privileged to have with us the proprietor of Ron's Tobacco Village, Mr. Ron Kern, and his wife Barbara. Ron, in fact, visited with me here at the rectory when I was recovering from surgery. And with them is another regular from the Village, the ever entertaining Mr. John Fruhman, and his wife Barbara. Our friend Paulie is working today and could not be with us, and Trooper Bill is out there already lying in wait to catch you speeding on your way home; and Joe Callarusso, our musician friend, has a gig tonight; all of them wanted to be here but couldn't. Psycho Bob is not here because we didn't tell him. And after dinner you're all invited over to the village for cigars and brandy. As most of you know, the last year or so has been very difficult. For the benefit of my brother priests, my parishioners are used to me saying things in a plain why, and have come to expect a lot of candor on my part. So you'll have to bare with me. I knew as early as two years ago that I was headed for some sort of showdown regarding my health. My diabetes, with which I was diagnosed in 2002, was growing increasingly worse; and there are only so many pills you can swallow and shots you can take before you have to weigh the decreasing benefits of them against the damage they cause to your liver and kidneys. At about the same time, I began to experience pain in my right leg, which had my battalion of doctors stumped for a while. The first diagnosis was bursitis, the second was arthritis, the same arthritis of the spine that had crippled my father. The third diagnosis turned out to be the winner, when they put me into an enormous machine and found that four of my lumbar vertebrae were disintegrating. The pain soon spread throughout my entire right side; and all of you recall what it was like during that time. I could not walk more than a few feet, and was celebrating the entirety of the Sunday Liturgy seated. And even then, I could only do that when pumped up on narcotics. At least the homilies were not boring. The nerves that control continence became damaged, which is why I rarely venture out these days. It was two of my doctors, my endocrinologist, Dr. Maman in New Jersey, and my Orthopedist, Dr. Cerciello here in Allentown, who teamed up to get me admitted to the bariatric program at Sacred Heart Hospital here in Allentown, and introduced me to Dr. Clarence Holland, the head of the department of surgery there, who, on March 6th of this year, gutted me like a fish, at least that's what it felt like when I woke up. The results have been both encouraging and discouraging. Where I was swallowing 15 pills a day, I now take three. Where I was taking three massive injections of both insulin and a hormonal protein each day, now I take none. And while no one is willing to pronounce the diabetes dead as yet, it looks like that part of this Endeavor may succeed. We won't know for sure for a couple of years yet, but it certainly looks good. With regard to the rest of it, you can plainly see that I'm walking a lot better, and the deterioration of my disks may—I repeat, may—have been arrested. The down side is that the damage may not be reversible. My medical team found a neurosurgeon who is willing to operate on me, but who was very realistic with me about the prognosis. He said there are basically three possible outcomes, with an equal chance for each: (1) it could help me to some extent, without willing to commit himself to how much, (2) it could leave me just the way I am, or (3) it could leave me much worse, much the way I was before I had the first surgery. The decision has been a difficult one. On the one hand, I'm 55 years old, and much too young to be hobbling around like an old man; but a one in three chance of returning to complete immobility is very alarming. I am still severely limited in what I am able to do for my two parishes as their pastor. The major problems are the pain, which is constant, especially since all three of my physicians have conspired to not give me anymore narcotics, not to mention the other problem which can be embarrassing, as the people of Ss. Peter & Paul parish have already learned. There are no weekday services in this church. I am able to provide for the weekend services because I don't have to provide for anything else. I visit the sick when necessary, and when one of our parishioners is in the hospital I go; but I can no longer do that on behalf of people from other parishes as I used to do frequently when priests would call and ask. And as far as other kinds of activities—continuing education, fund raising projects, social activities and the like—I've never stood in the way of anyone who wanted to organize something, so long as they understand that I will probably not be a part of it. I have decided to stay here on the job for as long as my limited level of service is considered sufficient. I will leave here when someone in authority tells me that it is no longer sufficient; and if that should happen, I will not argue. In my twenty-five years of priestly service, I have never once questioned or disobeyed a command from my bishop, and don't intend to start now. I will continue to serve here as long as they allow me, and after that, make myself useful to the Eparchy to the degree that the Eparchy allows, and that I myself determine I am able. You may think this speech is overkill, that there are a lot of priests in worse shape then myself, doing as much if not more than I am, and that may be true. Maybe this is all my own vanity playing out; maybe it's because I didn't expect to be like this at the age of fifty-five, and it scares me. But you and I have never played games with each other. As parishioners, you've been very honest and straight forward with me, as I have been with you, and we've never had a serious problem or disagreement in over ten years together. How many priests today can make that claim? And that's because of your respect for the priesthood, your devotion to the parish, and your plain downright Christian charity. Next to being ordained a priest twenty-five years ago, being here with you has been the greatest joy of my life. One of our parishioners here today does a great deal for the parish in spite of the many challenges she faces in her own life; and whenever I thank her for it, she says to me, “Father, I'm not doing this for you, it's for our Lord.” And she's not the only one. That's why I thought that we deserved this celebration together, cleverly disguised as a party for me. And I can't conclude my remarks without expressing my gratitude to everyone who pitched in to take care of me when I was released from the hospital: the people who did my shopping, the people who did my laundry, the people who came in the morning to make sure I was alive. The hospital wanted to send a nurse home with me, and I told them “No. My parishioners will take care of me;” and you did. So, who knows? Twenty-five years from now, maybe we'll do it all over again.